Our vehicle inspection security systems offer 360-degrees of protection. Hello and welcome to the new blog for Gatekeeper Security, an industry leader in optical-based security technologies. We focus on the integration of artificial and augmented intelligence to deliver high quality optical threat inspection and recognition tools. Our aim is to help organizations in the energy, transportation, commercial and government sectors increase security by removing the human failings of short attention span and replacing it with systems capable of noting the tiniest details. Let’s take a look at the technology we proudly provide to help protect people and places across the globe. Gatekeeper Security specializes in intelligent optical inspection and recognition technologies that utilize artificial and augmented intelligence. Whether a permanent part of your facility’s security system or a mobile station helping safeguard a temporary operating base, our suite of technologies will help keep you safe. This technology is available in both mobile and permanent installations, making it the perfect solution to your under vehicle inspection questions. Our automatic license plate readers excel for two reason. First, we offer superior image quality by pairing our monochrome or color specialized cameras with the Gatekeeper computer vision technologies. No matter what the weather condition, the use of advanced LED illumination in infrared and white light options ensure superior images. Second, our Optical Character Recognition software, the program that decodes the image into useable data, is extremely fast and accurate. Plus our automatic license plate reader technology can be incorporated into the AUVIS to give you a comprehensive look at each vehicle passing through your terminal, all presented together on the operator terminal. Our patent pending DriverCam is the perfect tool for identifying drivers in any type of vehicle or condition. Paired with a powerful targeted array of LED lights, the high-resolution machine vision camera can photograph drivers and passengers even in the presence of heavily tinted glass or sun glare. The camera is optimized to work just as well in the day as it does at night. The DriverCam’s images are such high resolution they can be used with facial recognition software, and the system can be integrated with AUVIS or Gatekeeper’s automatic license plate reader. The three technologies we just discussed combine to offer full 360-degree vehicle scanning for maximum security and efficiency. Easily scalable and customizable, this suit of technology offer unmatched performance and can be used with client created modules. Gatekeeper technology is compatible with a full range of entry control point technologies. Ports and other transportation situations require a fast and efficient way to turn container codes into alpha-numeric data files. Container code reading is much more difficult than license plate reading since lighting isn’t always great or even. Gatekeeper’s container code reader utilizes Optical Character Recognition software that is designed to quickly and accurately decode images of container codes into usable data. Using CCR can eliminate the chance for human operation error when manually recording container codes, and streamlines the process of recording and reporting codes. Much like the AUVIS, Gatekeeper’s GKR-TR11 Automatic Train Undercarriage Inspection System scans each train car and creates high resolution virtual 3D images. Instead of relying on a human operator, whose attention can wander or have limited knowledge, using video streams or line scanning systems, Automatic Train Undercarriage Inspection technology scans each car automatically and highlights areas of change. Our society relies on the energy industry to power everything we do. This reliance makes it a prime target for attacks. In order to protect themselves, nuclear power plants, natural gas facilities, oil refineries and water reservoirs are employing advanced security systems like those available from Gatekeeper Security. The use of AUVIS, an automatic license plate reader system, and DriverCam helps protect those in the energy industry worldwide. Large amounts of products and a large number of people are two things vulnerable to security threats. Railroad companies, cargo loading facilities, and seaports all have to worry about the security of their valuables and risk serious financial loss when products are stolen. Airports, railroads, and border crossings are potentially risky areas because of the large amount of human capital that travels through them every day. Taking moves to protect your customers, employees and property is never a bad decision. 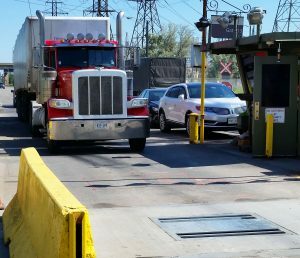 Commercial organizations can benefit from the added security AUVIS, DriverCam systems, automatic license plate reader systems, and container code reader systems can offer. From federal facilities to royal headquarters, government locations at home and abroad are constantly under threat, as are permanent and semi-permanent military operating bases in hostile territory by their very nature. Identifying those threats has never been more difficult than it is today, but Gatekeeper Security can help. Our suite of vehicle scanning technology can help keep government facilities safe from modern day dangers. This entry was posted on Friday, February 3rd, 2017 at 4:55 pm. Both comments and pings are currently closed.